Ever heard of the Intel Web Tablet, also known as Intel IPAD? No? Then you’re not alone. A decade before Apple unveiled their highly popular iPad, Intel developed a tablet of their own. Or sort of a tablet, as it wasn’t anything like the popular tablets we are used to seeing today. By the late 1990’s, Intel was working hard to supply semiconductors to many of the world’s servers and computers. Unhappy with just being a parts company, Intel decided to explore opportunities to diversify. In 1998, one of the several small teams Intel had working on the problem proposed the idea of a tablet. The tablet would give you mobility in your home by allowing you to play online without having to be seated at your computer. Back then that’s what “mobility” meant in world of technology. A prototype was built. The Intel IPAD had five buttons, a touch screen, and a stylus. The buttons would route users back to sponsored landing pages. Unlike tablets of today, the Intel IPAD would have to beg through your home computer but you would have been able to take it anywhere in your house via a wireless connection. Like today’s tablets you’d be able to browse the Internet, watch videos, and even play music. The prototype caught Intel chairman’s, Andy Grove, attention and he decided that the company should make and sell the tablet. He obtained funding and enlarged the team working on the tablet project from three researchers to around 100 workers. 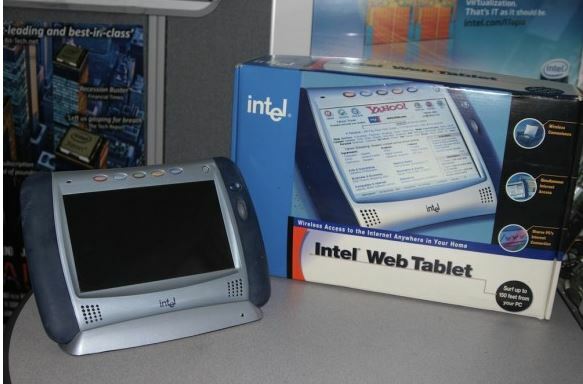 After years of tweaking and testing Intel announced the new tablet in January 2001. The plan was to sell the units later that year. Unfortunately for Intel, they had never been in the device business but rather been in the business of creating reference products. These reference products could be taken by Intel partners and rebranded or used as a model to make their (the customer’s) own designs. In other words, Intel would design products and companies like Dell or Hewlett-Packard would take the design of those and made it their own… but Intel never actually directly competed with its partners by selling devices itself. These partners weren’t so happy with Intel’s decision to make and market a product that would potentially compete with them. So, under mounting pressure, Intel canceled the project and instead sold the IPAD tablets to employees. “We all knew our toast was buttered. We all knew we didn’t want to do anything that would disparage or cause issues with our PC Partners,” said Ed Arrington a venture lead in Intel’s business initiatives group and one of the original designers of the tablet. He goes on to point out there were other reasons to scrap the tablet concept. The tablet was going to be pricey and would have shipped late due to software issues. It also came during the dot-com bust of the early 2000’s, a time in which Intel closed down all it’s consumer electronics operations to focus on its core fabrication business. Arrington says about the tablet, “Nowadays when we see tablets that are all touch screens, we look at them and say, we really were on the cutting edge back then.” We have to agree with him. Whether or not the Intel IPAD would have been a success or a bust is up in the air. Was the technology there to make a successful tablet in 2001? Compared to today’s tablets with all their apps and the ability to go away from the computer, the Intel IPAD looks like a child’s toy. But 15 years ago it might have been the next big thing. I guess we will never know.